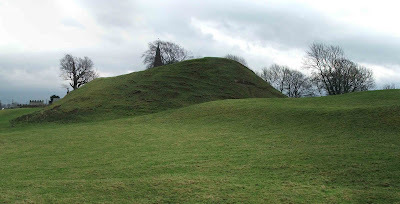 Here are some more photos of the spectacular motte and bailey castle at Burton in Lonsdale. The photo above, shows the banks of the Western bailey (the larger of the two) The ditch can just about be seen, to the left of the photo, with the bank indicating the Western extremity of the bailey to the right. The photo above, was taken from the church yard of All Saints in the village. 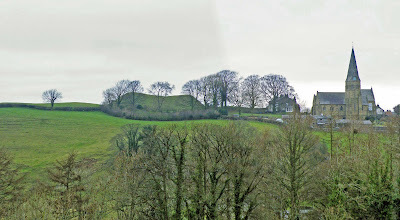 Even from such a low vantage point, the massive motte can still be seen. A great view of the motte and the church from the Southern banks of the River Greta. Looking North, this view demonstrates the great defensive point upon which this castle was built. Another view of the motte from across the River Greta. This view is taken from the Westerly most point of the larger of the two baileys. The ditches and banks are very well preserved here. The photo above, clearly shows the largest of the two baileys in the foreground. 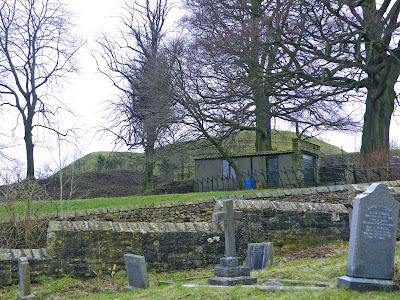 The motte and bailey castle at Burton In Lonsdale, was built as part of a line of defences along the Lune valley, along with a collection of earthwork castles rivaling those of the Welsh borders, and including Melling, Arkholme, Whittington (to which Castle Hill at Burton in Lonsdale was a subsidiary), Hornby, Halton and Lancaster. There is documentary evidence to suggest that the castle here was built to provide a line of supply on the route north to the recently established Norman castle at Carlisle, but whilst Carlisle undoubtedly saw a large amount of military action, it's unlikely that Burton in Lonsdale, being so far south, saw any 'action' at all. Indeed, records show that the castle was probably only manned in 1130, when the garrison consisted of a single knight, around 10 sergeants, a porter and a night watchman (thanks to North Craven Heritage for this information) This record of the garrison, and the costs incurred, are the earliest mention of a castle in the village. Like Halton further south, the manor of Burton was originally in the hands of Earl Tostig, until his death at the battle of Stamford Bridge on the 25th of September 1066. The Normans were quick to consolidate their control over these areas after their October invasion, with motte and bailey castles being built all along the line of the River Lune. The powerful de Mowbray family controlled the area immediately surrounding Burton in Lonsdale, but had estates elsewhere too. The castle was most likely where the de Mowbrays administered their estates from, and would have been an imposing focal point for the local communities. In the latter years of the 1290's, the de Mowbrays had less need for large estates, and sold huge areas to three powerful Yorkshire families: the Crepping, Youckflett and de Rypon families. It is believed that the castle was out of use and probably dismantled with only the earthworks surviving, sometime between 1322 and 1369.